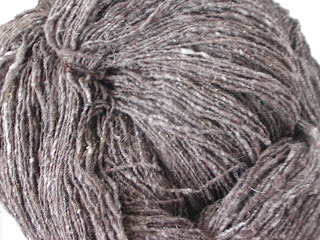 You have to be here to "get it"
This is the black/charcoal skein. It is actually darker than it appears in this photo, which is part of why I am researching a new camera. 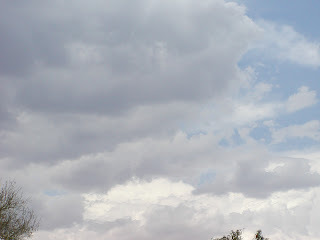 You would have to be in Arizona to really appreciate the clouds, when they start to roll in for the monsoon season. The relentless sun can bake your brain! Part of why I really notice the clouds is due to my fascination with color. I have become accustomed to the bright blue skies and changes make me go grab a camera. I try to reproduce the colors in my landscapes and in my batts. 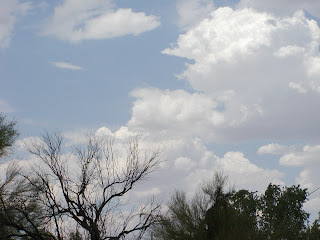 The dried out trees make a stark contrast to the billowy clouds. 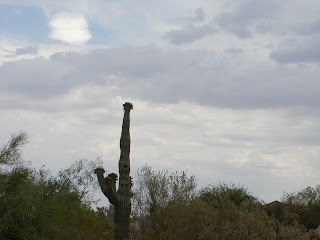 If you have been to the ranch, this dead ironwood tree is the one directly over the duck pen. Half hour before I took this photo, I saw rain coming down. Dust devils caused me to go inside and I came out to find the whole sky overcast. The animals are enjoying the respite from the heat. 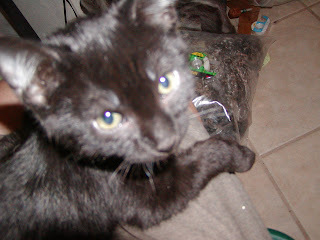 This is Kyle's new kitty, Smokey. I lured him out from under Kyle's bed. He got to meet Charcoal, the studio cat. They are afraid of each other.